Mention this add and we will throw in 2 cases of postal tabs for the t-750! You need to produce inexpensive non-enveloped mass mailings and brochures that look great and meet postal discount requirements with a tight secure seal on every piece.The versatile RENA Systems T-750 In-Line Tabber / Stamp Affixer produces high speed, high production and high quality tabbing or stamp affixing at a very affordable cost. Kick it up a notch in quality with precision feeding and accurate tab application all at production speeds, up to 20,000 pieces per hour. The T-750 will automatically apply clear, translucent, paper wafer seals, 1.5″ tabs, to a wide variety of open-ended media including mail pieces, folded stock, double postcards, newsletters, booklets, etc., up to 3/8” thick. The tabbing is accurate to within 1/16 of an inch. RENA Systems technology gives you the control to adjust speed and placement, and choose from a variety of programming options. You can apply one, two or three tabs or a postage stamp in a single pass. 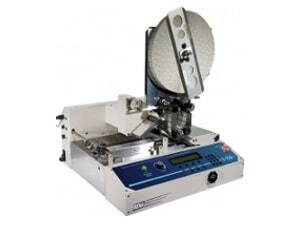 The Tabbing system is designed to run in-line with various feeding/printing devices. It offers synchronized speed control with the EASYFeed Lite and Start/Stop Control with other RENA Systems feeders. An emergency stop button and interlocks on all adjustments give you state-of-the-art safety. The Rena T-750 is easy-to-set up, easy-to-run and is built with heavy-duty aluminum and steel construction to give you years of reliable, high performance use. triple tab at to 8,000 pieces/hr. Bridging the gap between Floor Model and Table Top! For More Information Call All For Mailers Inc.